Adware might get installed on your computer or phone without your knowledge and start opening new tabs on your browser frequently redirecting you to various advertising and spam sites. Howningretoneand.info and its subdomains (ocfe.howningretoneand.info, r01s.howningretoneand.info, and so on) may be among the sites that the adware redirects you to. 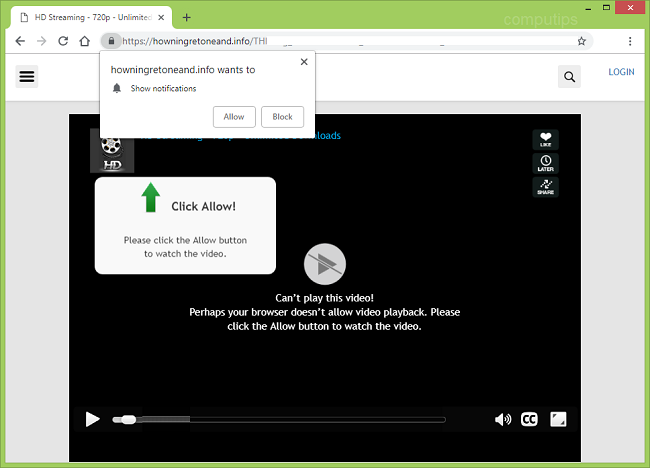 Howningretoneand.info attempts to trick users into clicking Allow button on a little pop-up box and by doing that enable Howningretoneand.info to send push notifications to these users’ machines. Push notifications are little pop-ups that show up in the lower right hand corner of the screen with some message from the site. Should a user click Allow, Howningretoneand.info notifications will begin popping up occasionally on his or her device promoting various suspicious sites or offering users to download some software. You may follow this step-by-step guide to get rid of the adware and stop Howningretoneand.info pop-ups and notifications.